Sleek branches adorned with pops of color give these Cherry Blossom thank you cards a whimsical feel that your guests are sure to notice. The words "Thank You" are displayed in a matching pink shade, adding a springtime appeal to the design. Or, you can fully customize the wedding font for your own unique look. 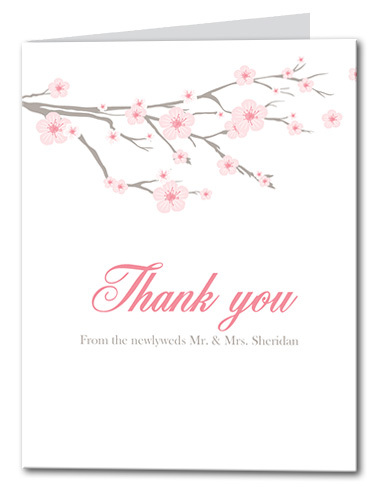 This thank you card is ideal for spring weddings, or even Japanese themed weddings. Cherry Blossom Thank You Card For the best experience, we recommend personalizing your stationery on a desktop computer.